HomeFirst TeamDanny Welbeck – Will He Succeed At Manchester United? Danny Welbeck – Will He Succeed At Manchester United? After a promising start to the season, Danny Welbeck hasn’t reached the heights many expected him to, this term. Injuries and heavy competition for a starting XI spot have resulted in limited playing time for the 22-year-old and we analyze Welbeck’s present and potential future as a Red Devil. Welbeck was only five years old when he begged then-United trainee Wes Brown to let him play football with the latter and the other older kids in the streets of the neighborhood the two lived. Initially reluctant, Brown delved into the demands of Welbeck. “We didn’t encourage it at first – we thought Danny could get hurt,” Brown said. Brown played a crucial role in Welbeck’s development as a football player and motivated the attacker to done the colors of United. They two played football together in a town named Longsight, just some four miles away from Old Trafford. And it wasn’t long before United scouted Welbeck, first as a six-year-old. Two years later, Welbeck gave a trial at Manchester City but was rejected. His parents were made aware of the rejection prior to Christmas but decided not to tell Welbeck. However, just a week later, United signed the prodigy after scouting him at a local tournament. Welbeck was a brilliant student academically as well, with 12 GCSEs. He could’ve pursued a career elsewhere, but he wanted to be a footballer and was rather good at it. He made his England U-16 debut aged 14 and made his United debut at 17, in which he missed a penalty. Welbeck’s Premier League debut came against Stoke City in November of 2008 and he scored a stunner from 30 yards out to announce himself on football’s biggest stage. His future looked bright. Welbeck had everything to flourish at the Theatre of Dreams. And according to Sir Alex Ferguson, the disease stagnated Welbeck’s growth. In case of 10 percent of Osgood-Schlatter patients, “the symptoms continue unabated into adulthood, despite all conservative measures.” And Welbeck seems to be one of those unlucky ones. Despite having recovered from the disorder, Welbeck continues to face niggling knee problems. By comparison, Stephan Ireland, who suffered from the same disease, has never stumbled to a knee injury in his career yet. In 2010, a knee injury cut short Welbeck’s Presto North End stint. On October 19th this year, a problem in the cartilage eventually put him out of action till the last week of November. In his only season at Sunderland, Welbeck suffered from four injuries. And after returning from his stint at the Stadium of Light, Welbeck has complained of 13 more injuries (seven related to his knee) in approximately 28 months. That’s an injury concern roughly nearly every two months. On Google, you’ll get more search results for “Welbeck injury” than for “Welbeck”. Initially, the knee troubles were delaying Welbeck’s integration into United’s first-team, but now they are hampering his chances to become an established striker at the club. Welbeck needs to play regularly. But with an attack containing Wayne Rooney, van Persie and Shinji Kagawa, he will get very few opportunities and he will need to pounce onto those. If he is on the treatment table when these opportunities present themselves, Welbeck will suffer and Moyes will start to lost trust in the player. After all, Welbeck has a lot to prove. He’s not good enough to walk into the first-team straight away after recovering from an injury, like say Rooney. Hence, Welbeck needs to reach higher levels of fitness. United and Moyes won’t be patient forever. There will be a time when they up on the striker, like Ferguson did on Saha. Welbeck will face the same fate if his injuries don’t reduce over the coming seasons. 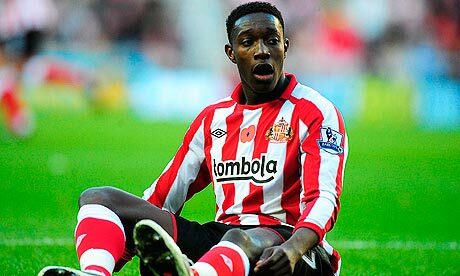 In the summer of 2010, Sunderland signed Welbeck on loan for the season. Welbeck got to play week-in-week-out at Sunderland. His first goal came in November against Chelsea. After a brilliant performance at the Stamford Bridge, Welbeck’s “confidence became sky high” (as per Titus Bramble) and he scored 11 more goals. Eric Black, Sunderland’s assistant manager at that time had a few good words to say about the lad after the Chelsea match. A month later, then Black Cats’ manager Steve Bruce spoke on Welbeck and reflected his disappointment on the fact that Sunderland won’t be able to sign the United player permanently. 1. Like every youngster, he needs to play regularly. 2. He’s got the potential, attitude and enthusiasm. One day in school, Welbeck refused to sprint 200 metres in a Game lesson. When his head teacher asked him the reason later on, Welbeck said he was playing the FA Youth Cup semi-final against Arsenal that night, but didn’t want to talk about it in front of the entire class. Welbeck is modest, shy and determined. He’s never complained about lack of playing time and has always shown respect for the club and his manager. He is a fun-loving personality in the dressing room as well. In the 2011/12 season, Welbeck’s became United’s first-choice partner for Rooney. Javier Hernandez was suffering from “second season syndrome”, while Dimitar Berbatov had fallen out of favor. Welbeck ended the term with 30 league appearances. He scored nine times from 80 shots and registered four assists. He lacked confidence in front of goal and hence, his finishing was sub-par. However, Welbeck showed flashes of brilliance and delivered in crucial games. He scored wonderful goals against Everton and Manchester City and found the back of the net against Arsenal as well. Lack of competition helped him but everything changed when United signed van Persie and Kagawa in the 2012 transfer window. Welbeck did play 40 matches, but in 34 of those, he operated out of position, on the left flank. Welbeck finishing has showed signs of improvement and his skill-set is unique. Welbeck links up admirably well with his teammates. He can be often seen dropping deep, swapping roles with his attack partner and moving to the flanks to provide assistance to the wingmen. In the 2011/12 term, Welbeck’s partnership with Rooney was excellent. It was a little indirect but the two had a very good understanding of each other and liked playing together. Welbeck’s movements, stamina and physical presence are also impressive. He can easily create spaces with his movements, run channels, run with the ball and recover possession. It was because of Welbeck’s work-rate and willingness to press from behind that Ferguson started him ahead of Rooney against Real Madrid. He repaid his manager’s faith and executed his duties of hounding Xabi Alonso very well. Welbeck has nearly all the skills- pace, stamina, work ethics, discipline, eye for goal, creativity, passing vision and strength. He only needs to improve upon his finishing and fitness. If he works on those two avenues, Welbeck will develop into one of the best strikers in England. Frankly, giving him more playing time in his central role can really help. Draft Welbeck into the team whenever he is fit. Play him for a stretch of six to ten games. He’s played as a striker three four this season and has contributed to five goals. When played consistently, Welbeck delivers. What do you think about Danny Welbeck? Comment in the section below. Great article once again, Surya. I agree that Welbeck would benefit from an extended run in the team but the same could also be said of Kagawa and Hernandez, indeed any player especially a striker. The reality is that football is a squad game and within the squads are rotations allied to a pecking order. If all players are fit, when Moyes picks his attacking players, it’s Rooney first, Van Persie second followed by a wide player, usually Valencia. The rest i.e. Welbeck, Hernandez, Kagawa, Young, Nani or Cleverley fill in the remaining positions. The wild card in the squad is Januzaj who will, quite soon, become a regular choice alongside Rooney and Van Persie. Welbeck and any other wannabe-first picks have to make the most of their chances when they come. Currently Welbeck is getting his chance playing centrally up front because of the injury to Van Persie. He needs to bang in the goals and make it difficult for Van Persie to get back in. He needs to force Moyes to rearrange his pecking order. However, Welbeck is in a better position than Hernandez and Kagawa both of whom could be on the move in the near future. Hernandez is bottom of the strikers’ pecking order. Kagawa is behind Rooney for the number 10 role and has been passed by Januzaj as the left side attacking option.